KCH is the entity which holds in trust, the Government’s non-petroleum and non-mining assets. KCH (formerly known as IPBC) was established in July 2002 under the Independent Public Business Corporation of Papua New Guinea Act 2002 (the “IPBC Act”). KCH, is mandated to hold all Government-owned commercial assets in trust and to manage those assets to improve commercial performance and underpin economic development. KCH is not responsible for the Government’s mineral, oil and gas assets. 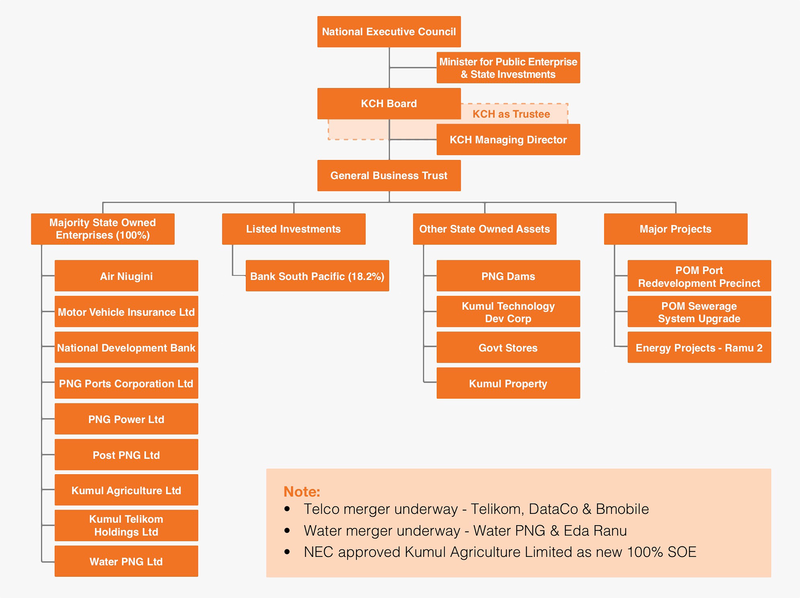 As a trustee, KCH is the holding company for nine (9) State Owned Enterprises (SOEs) operating in agriculture, aviation, banking and financial services, insurance, maritime infrastructure, power, post and logistics, telecommunications, and water and sanitation. KCH also acts as the manager of infrastructure projects throughout PNG such as hydroelectric power facilities, metropolitan sewerage systems property and port developments..
optimising funding opportunities for KCH and its investee. reports to the National Executive Council through the Minister for Public Enterprises and State Investments. to enhance the financial position of the Government or Government-owned enterprises. KCH’s accounts and records of financial transactions are audited by the Auditor General. KCH does not consolidate its accounts as it adopts a fair value approach of its assets and investments.